We all live under the same beautiful sun. You might say we share the same galactic address! So, what if one day, after 4.57 billion years without a day off, our sun decides to call out sick? What do you think would happen to our planet? Will Mother Earth and Miss Moon be able to convince Sun to come to work? Born in London, England with a passion for writing songs and poems. Arrived in the U.S.A. 19 years ago to chase this dream of writing hit songs for top artists. I guess the universe had another plan for me as my beautiful sunz took centerstage. After having my second son, I was inspired to try my hand at writing childrens books. 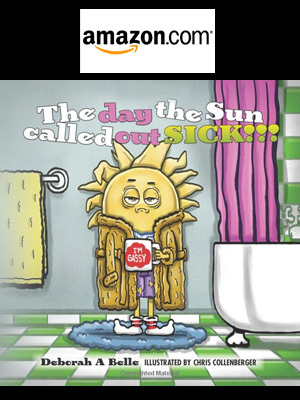 “The Day The Sun Called Out Sick!! !” flowed effortlessly from my mind and I knew it needed to be written, it felt right. Is a freelance illustrator living on Long Island, NY.